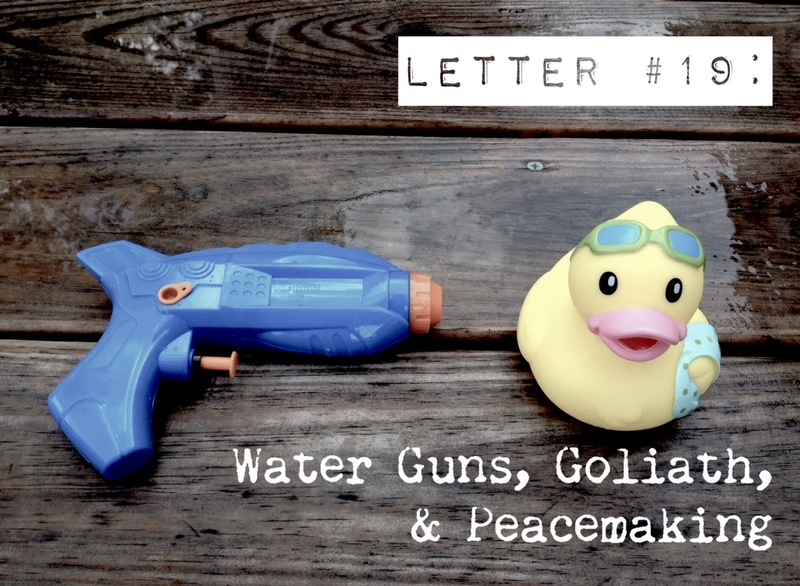 We’ve got friends who managed to call water guns “water squirters” for years in order to avoid using gun language at their home. We’ve got other friends who insist that if you ban gun toys, kids will manage to just “shoot” with other things–wooden sticks, bread sticks, you name it. I didn’t really imagine having to deal with this issue any time soon, and mostly avoided weighing in on either side. Despite having grown up using guns safely and being from a hunting family, my inclination these days is towards pacifism. We don’t own guns, but we do live in Kentucky. So they are everywhere. We were out drawing with chalk on the deck a few weeks ago, and the Bean wanted me to draw a snow person. After I did, she began scribbling right on top of it. Since we try to discourage blatant vandalism of someone else’s artwork, I asked her if she was drawing clothes for the snow person. She said no. She was drawing it a sword. I wanted to know where you learned the word “sword,” so asked you. Your answer? I guess if I want to raise up little pacifists, we better stop reading you a nightly Bible story. I’m confident that if guns had existed in Pharoah’s Egypt or Jesus’ Garden of Gethsemane, we’d have them in the Bible. Somewhere. Somehow. Guns into plowshares, maybe. And you, child, will be called prophet of the most high, for you have come to prepare the pathway for the Lord by teaching the people salvation through the forgiveness of their sins. Out of God’s deepest mercy, a dawn will come from on high, a light for those shadowed by death, a guide for our feet on the way to peace. Until last week, when we were discussing the beatitudes in church, I hadn’t thought about the similarities between the passages that I prayed for both of you, with both of you, during those nine months in utero. Both passages are about peacemaking, aren’t they? For me, it was simply that when I would pray for you, these were the verses that came to mind. I prayed that you would be compassionate, that you would have courage, that you would love people, that you would be a light in a dark world. I prayed for you to be peacemakers. Oh, and now Goliath is the Bean’s favorite Bible character. Granted, it’s because your dad does such a great HAR HAR HAR laugh when he reads the voice of Goliath, because he encourages the impressively loud THUD THUD THUD of Goliath’s footsteps. It doesn’t seem to matter that Goliath dies at the end of the story. Doesn’t matter that little David with his five smooth stones is really the hero who gets the best lines: “It isn’t how strong you are or how many swords and spears you have that will save you–it is God who saves you! This is God’s battle. And God always wins his battles!” Doesn’t matter that the picture of Goliath makes him ridiculously unappealing, gaps in his teeth and all. Goliath is your favorite. And Goliath has a sword. Last weekend, arriving home from an out of town wedding, we found two small bags of goodies for you on our porch, dropped off by our neighbors. Each bag had a little bottle of bubbles and a bouncy ball that lights up. And each bag also had a water, ahem, gun in it. They look like something out of the space age and bear very little resemblance to the pistols in holsters I’ve seen around town. But later, when we were filling them and squirting them and talking about them, it still felt really weird for me to use the word “gun” and talk about one of our toys. Guns? Really? My girls? Carrying around guns? And yes, Goliath is your favorite. And yes, you will be peacemakers. This doesn’t seem discordant to me. In fact, I have a hunch that you will be teaching me what it means to be a peacemaker someday. What it means to be compassionate. What it means to be a child of God. With a water gun in your holster.